Emilyn Stam (www.emilynstam.com) is a Toronto-based fiddler, pianist and accordionist who creates, performs, records and teaches in folk, trad, and neo-trad styles from Europe and Canada. Her unique style is largely influenced by her mentor, the late Oliver Schroer, but also by her 4 years touring with Eastern European party-punk-super-band Lemon Bucket Orkestra, playing for “Balfolk” social dancing events with the Dutch band Té, classical piano training, and accompanying Canadian fiddlers Anne Lederman James Stephens in “Eh?!”. She has toured throughout Canada, Eastern and Western Europe with The Lemon Bucket Orkestra, The Shoeless, Eh? !, Filippo Gambetta (IT), John David Williams, and Té (NL). She co-founded Balfolk Toronto, a new movement of social folk dancing in Toronto which hosts weekly drop-in dance evenings with live music. She regularly crosses over into other art forms, collaborating with improvising clowns, theatre groups, contemporary dancers and poets. In 2015 she completed the 2.5 week intensive Baby Clown course led by John Turner on Manitoulin Island, and in 2014 choreographer Suzette Sherman created a 3 movement dance piece to 3 of Emilyn’s compositions. 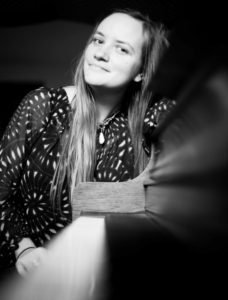 Emilyn has taught at various fiddle camps (Castlegar, BC Fiddle Camp, Goderich Celtic College, AlgomaTrad) across Canada, teaching both her unique piano accompaniment style and fiddle classes in ensemble playing, fiddle composition, Canadian fiddling, and Oliver Schroer tunes. Emilyn has performed festivals (Montreal Jazz, Vancouver Folk Festival, etc), house concerts (Home Routes), and venues large and small throughout Canada, Western and Eastern Europe in various musical projects. She has released 8 albums and appears on at least 25 other recordings, including David Woodhead’s “Confabulation”, Oliver Schroer’s “Smithers” and Jaron Freeman-Fox’s “Manic Almanac, Slow Mobius”. She has 4 Canadian Folk Music Award Nominations, (The Shoeless, Eh? !, Lemon Bucket Orkestra) and 2 Juno Award Nominations (Lemon Bucket Orkestra). Emilyn performed in both seasons of the TV show Galala (UNIS TV), as a member of the house band (synths, organ, piano, accordion, violin), co-arranger and co-composer.